If Dice Ailes wasn’t already a household name before he released “Otedola”, which spawned into a hit and a slang, the track itself certainly made him into a mainstream superstar. His latest single, “Dicey”, embellished with lyrics that sing praises of himself, listens like a testament to his stardom. Over the mid-tempo beat bop Ckay produces with percussion instruments and cheering vocal samples, Dice Ailes confesses that he’s “Making more money” and “Your girlfriend is feeling (his) melody”. Although his lyrics also carry some shade for his competitors and those who belittled him before he got so successful, the video directed by Tee Tash of Visionarie Pictures, only emphasizes his wealth and chic magnet with colorful designer clothes and beautiful admirers chasing him in his drop-top car. 2 Chainz is set to release his 5th studio album, Rap or Go to the League in the following months. His lead single, “Bigger Than You”, featuring Drake and Quavo already has a video. All three artists seem too cool for school as Nathan R. Smith directs the video showing child actors playing the roles of the three rappers in high school. The cinematic clip follows 2 Chainz and his crew, as they perform their rap bars while they sit in detention and cause mischief. Donning a fur jacket, shades, and head scarf, the young Drench God and friends take over the library, terrorize their teachers, and throw a party in the halls, making for a fun hip-hop video that may be wrongfully inspirational for kids. Off his recently released Tobi Lou and the Loop EP, “Buff Baby” was a standout track which featured Tobi Lou interpolating the “Puncha Your Bun” song from an episode of Adventure Time to reminisce on heartbreaks that have inspired him. The music video Ronald Grandpey animates for “Buff Baby” is also inspired by the cartoon, showing Tobi Lou carrying a singing baby version of himself through a surreal animated landscape where butterflies and flying rainbow ponies sing along to the song’s lyrics. With his consistent release of feel-good rap songs, sampling Adventure Time almost seems like a natural cross over. For “Flex”, CDQ’s latest single, he ditches the hip-hop beats that made his Afro-house songs so famous in favor of string, high-life and house influences produced by Jaypizzle. With Fiokee handling the guitar harmonies, the house instrumentals are locked to an irresistible groove, which sets the mood for CDQ’s celebration of wealth. “Flex” was released with a video set at a party in South Africa as if to show CDQ’s respect for the booming South African House music scene. However, it is more likely that he’s just there to flex. As we see the Mazi C.I Jizzle directed clip showing CDQ party so hard, he steals the love interest of one of the party guests. Four months after his death, XXXTentacion posthumously releases a video for his hit single, “Moonlight”. The video is the second posthumous release, following the release of “SAD!” in June. X wrote and directed the video himself, set at a party in the woods where he seems comfortable, smiling at his friends, but never speaks to anyone. He is seen with headphones in certain shots, but everyone else is dancing to the music. The video also hints at a possible love interest lurking in the background, but XXXTentation remains lonesome under a tree, tuning out the world while occasionally smiling at his phone. Although it won’t be a reach to assume the video speaks to the rapper’s everyday life as a young boy, the relevance of the commentary it gives on party culture is one that almost all young people can relate with. The last we heard from X came through a posthumous feature on Lil Wayne’s Tha Carter V, Kanye West has also hinted a potential feature on his upcoming Yandhi album as well. 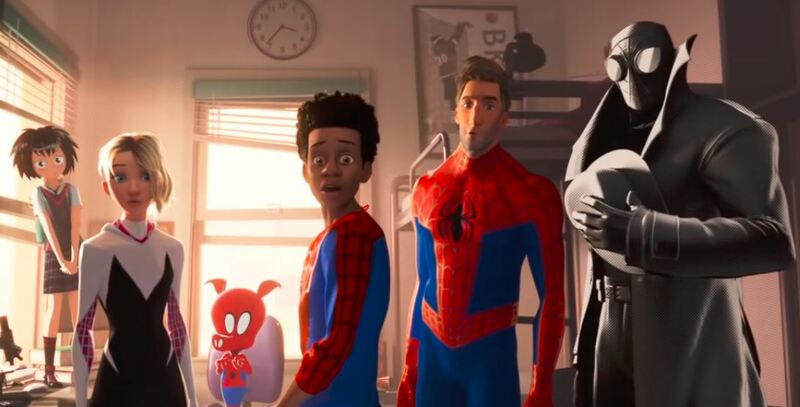 It has been confirmed that Spiderman: Into The Spider-Verse would hit cinemas December 15th. Anticipation for the animated film has been high since the first trailer was released. Phil Lord and Christopher Miller have also upped the ante for the new Spider-Man Universe through their creative work in The LEGO Movie and 21 Jump Street. Their animation style is the first of its kind and the surreal ambiance is just fitting for the alternate dimension narrative of the film’s script. 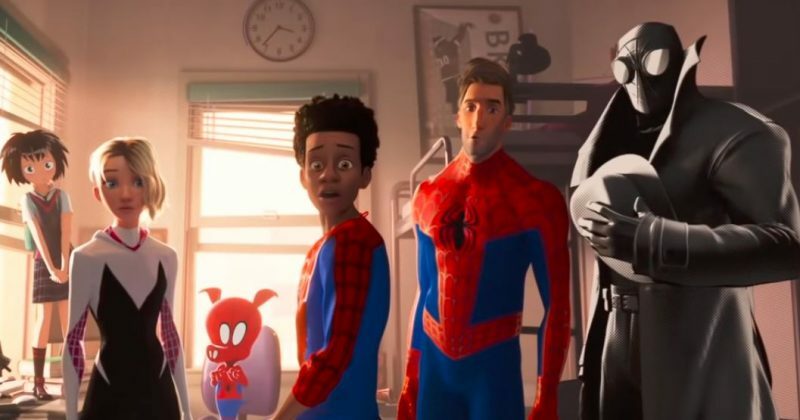 The first trailer already introduced Brooklyn teenager, Miles Morales, his dad and the Spider-Verse, where more than one person can wear the mask. The newly released trailer details the other Spiderman characters that will feature in the film, including Scorpion, Spider-girl (played by Gwen Stacy), a detective looking Spiderman and a Spiderman from a dimension where pigs can talk.